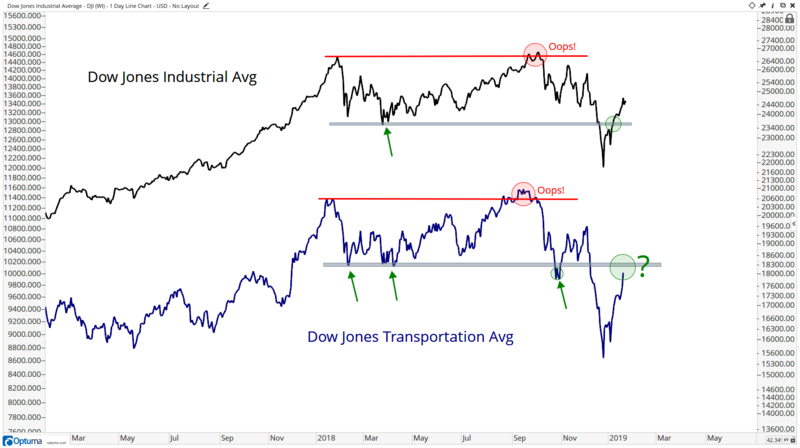 When you hear people talk about Dow Theory, it usually revolves around what the Dow Industrials and Transports are doing. Are they diverging or confirming one another? I want to be perfectly clear that while this is certainly one of Charles Dow’s tenets from the late 1800s, it’s just one of many — and not even in the top five, as far as I’m concerned. I encourage you to check out what I do consider the most important in tenets in my Guide to Winning Technical Trading, which all Breakout Profits readers receive upon subscribing to my trading service. But, today, we are indeed going to focus on the behavior of the Dow Jones Industrial Average and Dow Jones Transportation Average. Last week we discussed the Dow Jones Composite in “What the Most Important Stocks in America Are Doing Now,” Jan. 25), which includes the 15 stocks in the Dow Utility Index as well. For this conversation, we’re analyzing just the Industrials and Transports. Let’s look at a very simple line chart going back a couple of years. It’s clear how much the Dow Industrials and Transports move together, which is not surprising. Notice how the Dow Jones Industrial Average is already above its early 2018 lows. That’s evidence that there is more demand there than supply. 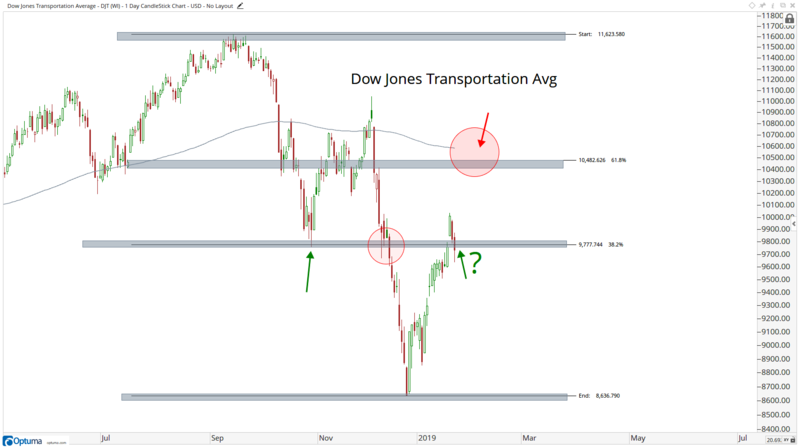 Is the Dow Jones Transportation Average about to reciprocate? Here are the Transports on their own. If we’re above $9,800 I think we need to err from the long side with a target near $10,500. If we’re below $9,800 then I think there are probably some bigger issues out there from any kind of intermediate-term perspective. And I believe that likely speaks to the whole market and not just Transports. As always, we want to take the data as it comes in and continue to reevaluate things.